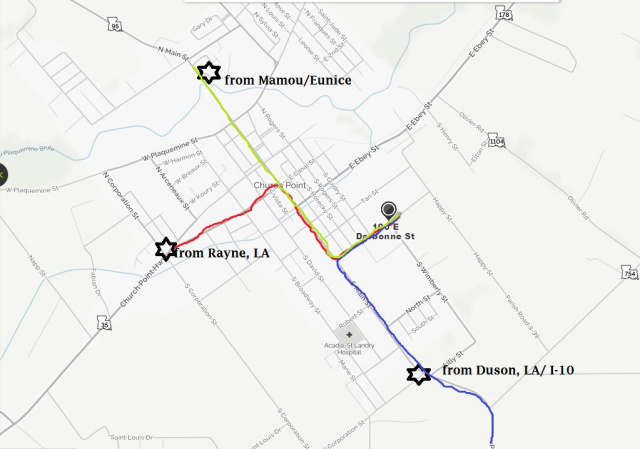 Hwy 95 From Mamou - Go to center of town and turn left onto Lougarre Street. Hwy 95 from 1-10 - Go to center of town and turn right onto Lougarre Street. Hwy 35 from Rayne - Go to center of town and right onto Main Street (Hwy 95) and turn left onto Lougarre Street. Hwy 35 from Lawtell - Go to center of town and left onto Main Street (Hwy 95) and turn left onto Lougarre Street.